The belt has been worn by some of the sport’s all-time greats, whether it’s pound-for-pound kings from another era or today’s rising stars. Canelo Alvarez, Timothy Bradley Jr., Danny Garcia, Humberto Soto, Jorge Arce, Leo Santa Cruz — all at one time or another were crowned youth champions by the World Boxing Council, arguably the sport’s most recognizable sanctioning body, and all went on to become world champions, cementing their status as ring legends. On Saturday, Feb. 23rd, 2019, two undefeated lightweights will have the opportunity to join the long list of former and current youth champions, many of whom, again, have gone on to achieve greatness unmatched by their peers. 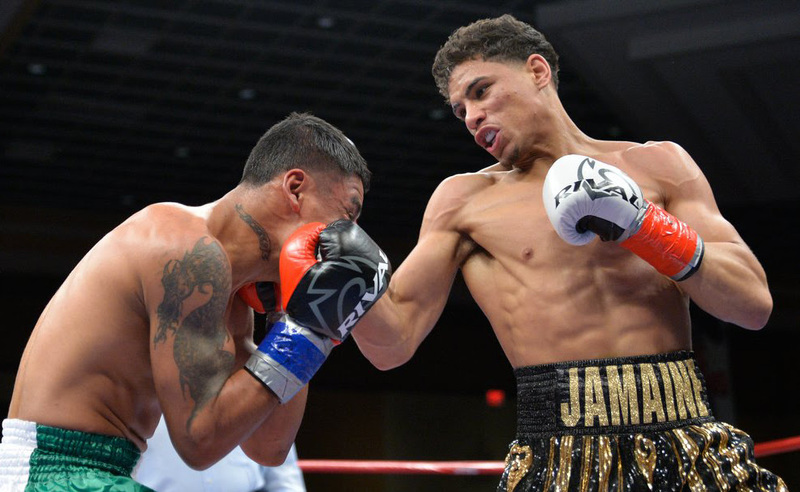 Twenty-two-year-old Worcester, Mass., prospect Jamaine Ortiz (9-0, 4 KOs) faces 21-year-old Oxnard, Calif., standout Ricardo Quiroz (10-0, 5 KOs) at Twin River Casino Hotel in an eight-round bout on the main card of CES Boxing’s 2019 season opener on VIVE TV Network for the vacant WBC World Youth Lightweight Title, a belt previously held by former world champions Juan Diaz, Daniel Estrada and Josesito Lopez. The latter recently battled welterweight world title-holder Keith Thurman on national television and is trained by the world-renowned Robert Garcia, founder and owner of the famed Robert Garcia Boxing Academy in Oxnard. For nearly two decades, Oxnard — located 61 miles west of Los Angeles — has been a hotbed for boxers looking to take their careers to the next level. Following a long layoff due to alcohol abuse, former world champion Kelly Pavlik relocated to Oxnard in 2012 to begin the final stretch run of his career, which ended with three consecutive wins. Two-time Lithuanian Olympian Egidijus Kavaliauska packed his bags in 2013 to move to Oxnard to train with Garcia before launching his pro career. Five years later, he’s the reigning NABF welterweight champion with a perfect 21-0 record. Garcia also trains his younger brother, four-time world champion Mikey Garcia, and former WBA World Featherweight Champion Abner Mares while shuttling between his Oxnard and Riverside locations, so the sparring is always competitive. Quiroz himself has sparred with former WBO world champion Ray Beltran and unbeaten lightweight prospect Ryan Garcia. A graduate of Hueneme High School in Oxnard who began boxing at 8 years old, Quiroz recently won his 10th pro fight in Tijuana in December, flattening Luis Cueto in 76 seconds. The New England-born Ortiz began crafting his skills at the age of 7 at the Worcester Boys & Girls Club at the behest of his father, who told him to take his pent-up aggression — most of which he unleashed at school — and put it to use in the gym. Under the tutelage of regional icon Carlos Garcia, Ortiz boasted a 100-14 amateur record, winning almost every New England tournament in the process, and advanced to the semifinals of the 2006 U.S. Olympic trials in Nevada, where he eventually lost to Gary Antuanne Russell. A full-time union carpenter who also attends school and takes care of his daughter, Ortiz turned pro in 2016 and has continued to climb the ladder with each fight. In just his fourth bout, he blasted unbeaten Michigan prospect Glenn Mitchell, then took down 16-fight vet Derrick Murray in December of 2017. Eight months ago, his last fight since being sidelined with a minor injury, Ortiz faced the hard-hitting, upset-minded Tyrone Luckey of New Jersey and broke him down within three rounds, scoring the knockout with six seconds to go before the bell. Ortiz-Quiroz is one of three title bouts on a stacked fight card Feb. 23rd. Tickets for the event start at $47 and are available online at www.cesboxing.com or www.showclix.com or by phone at 401-724-2253/2254. All fights and fighters subject to change. The WBC Youth Title is as prestigious as it gets for fighters 23 and younger. Time has proven the famed green belt is a legitimate stepping stone to world-title success. From Alvarez to Arce, many notable WBC youth alumni have gone on to reach boxing’s pinnacle. Alvarez, who captured the WBC Youth title as a welterweight in 2009, is boxing’s most recognizable star, a world champion in three different weight classes and one of the richest athletes in professional sports after signing a $365 million deal with video streaming service DAZN in October. Other former youth title-holders who’ve gone on to win world titles include Erik Skoglund, Julio Cesar Chavez Jr., Kermit Cintron, Devon Alexander, Rodolfo Lopez, Billy Dib and Daniel Ponce De Leon. In an interesting side note, Connecticut’s Chad Dawson, who began his career under the guidance of CES Boxing president and CEO Jimmy Burchfield Sr., joined that list in 2007 when he won the first of four world titles by defeating Tomasz Adamek for the then vacant WBC light heavyweight crown. Dawson also joins fellow Connecticut native Matt Remillard as the only CES fighters to capture WBC youth titles; Dawson won the youth middleweight title in 2003 while Remillard won both the super featherweight and featherweight titles in 2006 and 2008, respectively. In addition to the WBC youth title bout, regional female super bantamweights Marcia Agripino (3-1-1) of Ledyard, Conn., and Boston’s Amanda Pavone (6-0, 2 KOs) face one another in an eight-round bout for the vacant New England Championship. Also, hard-hitting heavyweight Juiseppe Cusumano (17-2, 15 KOs) battles “Brutal” Brendan Barrett (7-1-2, 5 KOs) of Ventura, Calif., for the National Boxing Association (NBA) World Heavyweight Title in an eight-round special feature. Junior middleweights Victor Reynoso (2-0, 2 KOs) and Lamont Powell (2-0, 1 KO) of Providence face their toughest tests in separate four-round bouts. Reynoso battles 1-0 John Williams of Baton Rouge, La., who scored a knockout win in his pro debut in August, while Powell battles 29-year-old Kenneth Chery (1-1, 1 KO) of Montreal Quebec. Unbeaten Providence featherweight Ricky De Los Santos (6-0, 1 KO) returns in a separate six-round bout, his first since September. The undercard also features the return of Providence lightweight Michael “Bling Bling” Valentin (4-0, 1 KO), the eclectic 19-year-old who fights despite being born with a rare intestinal disease known as Hirschsprung’s. Valentin endured bullying throughout childhood and fights wearing a colostomy bag. He returns Feb. 23rd one year to the date of his last fight and will dedicate his fifth pro bout to the memory of Seven Bridges, a 10-year-old Kentucky boy who committed suicide after being bullied for wearing a colostomy bag. Valentin faces Philadelphia’s Christopher Burgos (1-3-1, 1 KO) in a four-round bout. The Feb. 23rd fight card streams live on VIVE TV Network, a revolutionary ultra-high definition live event platform available globally on every screen in every format. The event begins at 7 p.m. ET with the live stream launching at 8. VIVE TV is available on Roku, Amazon Fire TV Stick, Android TV and all Apple and Android devices for $5.99 by signing up at https://tickets.vivetv.network.